Nassau, Bahamas - The 2018 Bahamasair Christmas Day Fly-Out demonstrated that The Spirit of Christmas was flowing at the national flag carrier, as the event brought joy to the hearts of many deserving young people. 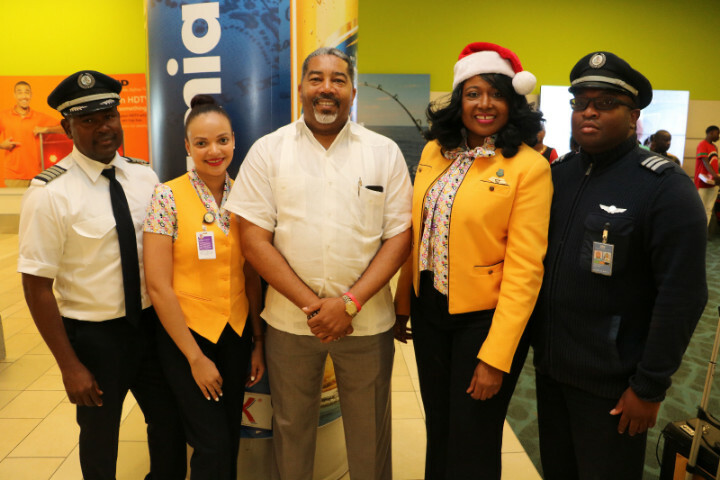 The national flag carrier Bahamasair in conjunction with the Ministry of Social Services & Urban Development on Christmas Day, continued the tradition of spreading cheer to those less fortunate by flying some 33 children to Exuma for a one-day getaway. The annual event is a highly anticipated one for many Bahamasair staffers is considered the perfect way to give back to the community through spreading the joy of Christmas with children of the various Government run homes on New Providence. The event is one that Bahamasair’s Chairman Tommy Turnquest says was fully supported by airline’s Board of Directors, management and staff and serves as an example of the company’s commitment to good corporate citizenship. The Chairman further noted that Christmas is a special for the national flag carrier and despite being very busy with passengers gives the company a chance to pause and really give back to the less fortunate in society. Mr. Turnquest extended his thanks to the hardworking men and women at Bahamasair who really go above and beyond to put on the annual event that continues to provide such a positive experience for the children. Minister of Social Service & Urban Development the Hon. Frankie Campbell who was present at the sendoff, decided to join the children on the trip, to share in the experience first-hand. Minister Campbell in noting his appreciation to the airline stated that, “this is a wonderful gesture from Bahamasair, where our children can realize that being in a home does not limit them from experiencing what the Spirit of Christmas is all about.” Upon arrival in Exuma, the group was treated to a hearty down-home breakfast, followed by an island tour that included the Pompey Monument and a visit the settlement of Barraterre. The day culminated with a Christmas Day extravaganza at the home of Mr. Jeremy Mutton, General Manager of Sandals Emerald Bay Exuma. The children were treated to an afternoon of fun with exciting games, food and even a visit from Santa Clause who presented each child a gift. The participants also had the opportunity hear words of encouragement from two of Exuma’s more recent success stories in the person of Samson Colebroke, Purdue University athlete and Bahamas national team sprinter and Hanzel Rolle nationally recognized youth chef who has represented the Bahamas at numerous international cooking competitions. The young men shared their stories of success with the children and encouraged them to, never give up. The Minister shared his experience during the trip with an eight-year old female, who said that after enjoying the hospitality and beauty of the island, she now has a desire to live in Exuma. This the Minister noted, spoke volumes, and convinced him that the Spirit of Christmas was alive and well. The Minister further noted that, “The children experienced firsthand what it is to be cared for and given a reason to say Thank You, and in the end I’m looking forward to next year. I wish Christmas would come early.” In wrapping up Minister Campbell stated that, “I am impressed with the effort and time put into organizing this fly-out, and grateful on behalf of the Children who can’t speak for themselves. There is hope that we will breed a group of productive citizens in this lot." By all accounts, the event was a success, especially when looking at the smiles on the faces of the children. The event was made possible through the collective efforts of a number of persons more specifically the team from Bahamasair led by Ms. Sabrina Wright (Corporate Secretary/Senior Manager), Mr. Tracy Cooper, Managing Director (Bahamasair), Mr. Selvin Basden, (Bahamasair). Officials from the Department of Social Service led by Mrs. Lillian Quant (Director of Social Services), in addition to the team from Sandals Emerald Bay Exuma led by Mr. Jeremy Mutton (General Manager), The Bahamas Ministry of Tourism (Exuma) led by Emmit Saunders (Island Manager), Rubis (aircraft fuel), CP Morley Enterprises, Exuma Foundation, Exuma Chamber of Commerce, Aliv, Kendra Knowles, Don Smith, Exuma Tourism Office, Dunkin Donuts (Nassau). Special thanks to the Management & Staff of Kermit’s Airport Lounge. Without the efforts of these persons, none of this would have been possible. VOLUNTEERS: Stuart & Allyson Kelly Wayne Curtis, Lynden Curtis, Whitney Curtis, Kazmyn Smith, Ricardo Munroe, Shallini Dame, Taliyah McKenzie, Tamara Robinson, Mya Robinson, Inaru Dames, Christopher Kettel.